My living room pelmet box has been on my to-do list for a LONG time...I've had the fabric since about November and the trim since Christmas...but this was a project that would need Carter's help and thus has taken a while to get to as he's bee minding other tasks here at the AO house. But, this past weekend he committed to knocking out some cosmetic projects with me and my pelmet box was at the top of the list. And I'm happy to report that we accomplished the task on Saturday and I am most content with the results. I wish this was a better d-i-y instructional, but hopefully with the pictures you'll see the evolution of how we put the pelmet box together. 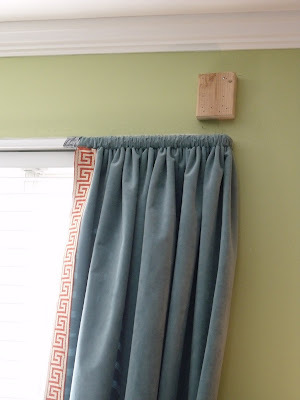 A pelmet box is essentially a valance in that it adorns the tops of windows to hide the hardware underneath...but a valance is sometimes just a short curtain of fabric, whereas a pb is an actual box that can be covered in fabric and gives a more tailored look to a space (I think). Our pelmet box started with a trip to Home Depot to find a nice plank of wood - in our case, we chose a 12x1 board to work with. Our window is quite wide and we didn't want the box to sag, so we opted for an actual piece of wood to keep the piece sturdy. 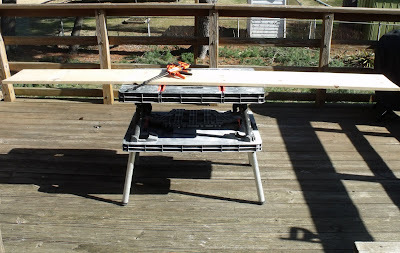 But, you can make pelmet boxes out of lighter materials that don't require power tools as explained here. After measuring our window, Carter took the board out on our deck so he could cut it to our measurements with a jigsaw - he also cut two smaller pieces of wood that he nailed perpendicular to the board to make endcaps (2nd picture) that would give us the depth to put the box over our curtains. The 2nd picture above shows a good image of the endcaps - we made sure to leave enough depth so the box would fit over our existing curtain rod. Once we were satisfied with the board, my job began. 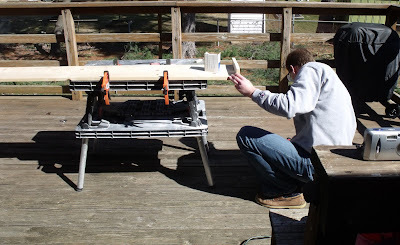 My first step was to cut a piece of batting that would cover the board. I then lay my fabric under the batting so I could staple both the fabric and the batting to the board at the same time. 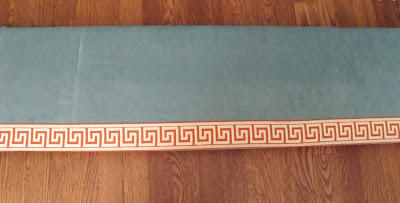 It's very hard to find a piece of fabric that is wide enough to cover a board this width (about 75") so I chose a solid fabric and used a 54" piece in the center and then sewed two pieces to either end to make up the rest of the width. I stapled, stapled, stapled (I love my staple gun) until my board was covered. The corners were tricky and I don't have a good way to suggest covering corners except to keep your scissors handy to cut away excess fabric and staple down the fabric as tightly and best you can. 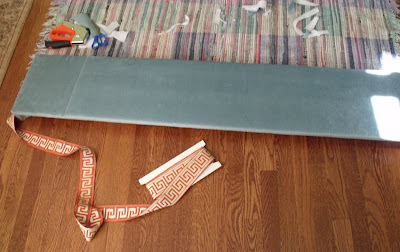 Once my board was all covered, I added my orange Greek key trim using some fabric glue to attach it to the board. This was the first time I used fabric glue for a project like this and I had my doubts, but it definitely worked really well. At this point, I'd say we have both spent about 2.5 hours on the task...Carter spent about 1-1.5 hours putting the board together, and I spent about 1 hour covering it and adding the trim...so we had a pelmet box in no time! Now our task was to install it over our curtains. Before we did that, I went ahead and used the fabric glue to add the trim to the inside hem of the curtains that were already hanging made of the same aqua velvet fabric - that took about 15 minutes...it was so easy! Below is a picture of how we fastened the box to the wall. Carter actually cut blocks of wood which he attached to the wall with a series of nails (we were lucky to find studs in the walls to attach them to). Once the blocks were in, we screwed the pelmet box into the blocks of wood from the side...I left the sides of the box un-stapled so Carter could pull the fabric back to screw the box to the block. Once he was done, I was able to tuck the fabric back behind the endcap (Carter left a little sliver of space where I could tuck the extra fabric) and I used a staple gun to staple the fabric down to the top of the endcap. 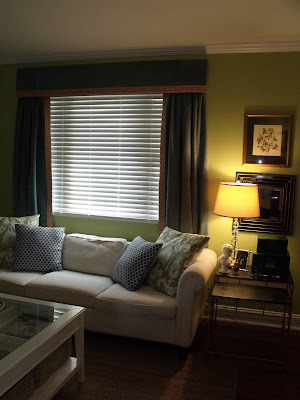 This picture above also shows how we installed our curtains - we used one of those really inexpensive white metal rods that attaches to the wall. I simply sewed a 1" or so pocket at the top of each panel to slide over the rod (and with velvet, I actually didn't have to finish off the left/right edges and I left the bottom hem undone since they tuck behind the couch...shhh). We also used a bit of duct tape to pull the curtains taught and keep them there since we don't plan to ever close these curtains. And here is our pelmet box all done! I of course neglected to take pictures of the finished product while it was still light out because once we were done, our living room was quite messy, so I didn't take the last two pictures until the sun started setting, and well, they are not very good, but hopefully you get the idea despite my photography. The pelmet box makes such a HUGE difference in our living room...the room actually feels finished (even though it is not). And, the project was really quick - we probably spent 4-5 hours or so total on it from start to finish, and we got a big result. It was definitely a productive Saturday! I have one more living room project that I wrapped up this weekend that I'll share tomorrow. It looks fabulous! I love the trim. I've been considering doing this for my living room window and you might have just convinced me to go for it. So fabulous and totally gorgeous! The trim elevates those window treatments to a whole new level. Where did you find that fabulous trim, by the way?! Fantastic Daniela! I absolutely love how it turned out. Where'd you score the trim, btw? aahhhh...just saw your previous comment: thanks! ahh, I love this!! 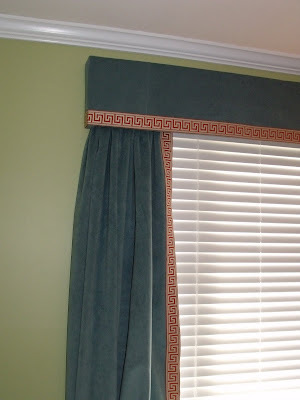 I MUST have that greek key trim for my bedroom curtains, where did you get it?? Looks awesome. You and your husband did a great job! Wow! It looks great. Kudos to you and Carter. I can't believe how little time it took considering how polished it looks. This is a spectacular look and I am so proud of what you are doing with your home. Kudos to Carter... he takes after his dad :>) I can't wait to see all of it in person. Wow amazing, it looks expensive! I've been wanting to do that in my living room, too. Thanks for the post. I you put a top on the pelmet box it will prevent the window from sucking heat from the room in the winter. A top cover traps air between the closed curtains and the window. Without it, warm air travels between the window and curtain, cooling down before it exits the top. Where are the drapes / fabric for the panels from? How did you decide on a material?